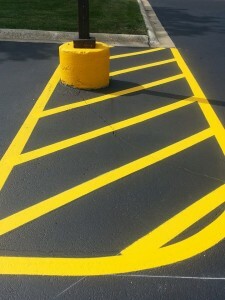 A parking lot is one the first things a customer, visitor or client notices when entering your facility. The bright lines and color contrast is a good indication that the property owner emphasizes maintenance. A well marked parking lot will include parking stalls, crosswalks, stop bars, no parking zones and drop off and pick up areas to keep your patrons safe. To help preserve the integrity of your parking lot Tru-Seal has the capability of re-striping your existing lot or change the layout and design based on the information given by the owner of the property.